4 Drops, 5 Minutes and 7 Nights! 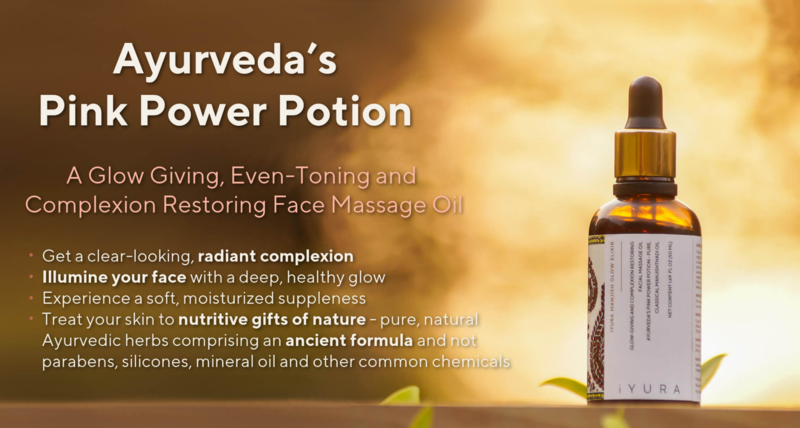 Says ‘Chakradutt’, an ancient Ayurvedic Text while talking about Ayurveda’s Pink Power Potion. What is this that the texts speak so highly of? What’s so powerful about it? 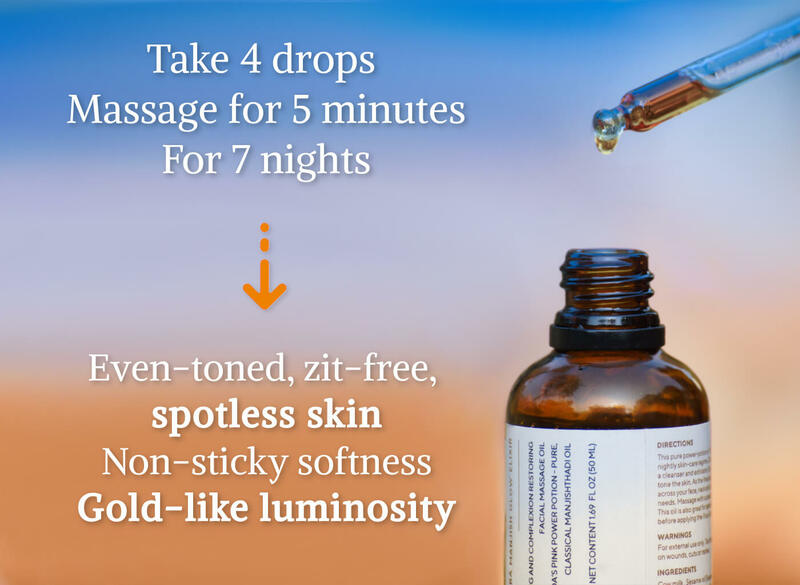 And how does it work in just 4 drops, 5 minutes and 7 nights? Notice a difference in just 7 nights! The ancient texts spoke this highly of the classical formulation of ‘Manjishthadi Oil’. Hefty name, complicated to pronounce too, right? Be assured, it’s just as powerful! With this oil, a golden glow is really only a bonus! 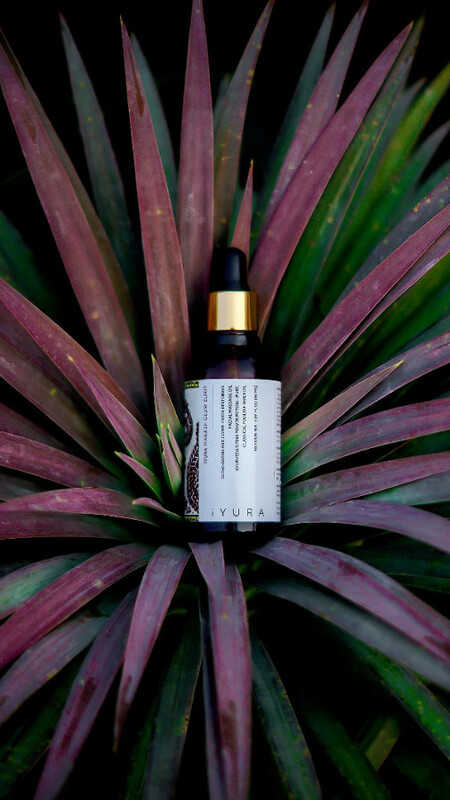 A beautiful pink-colored elixir, this face oil is actually specifically meant for acne-prone, patchy skin, as well as dull and uneven skin tone. 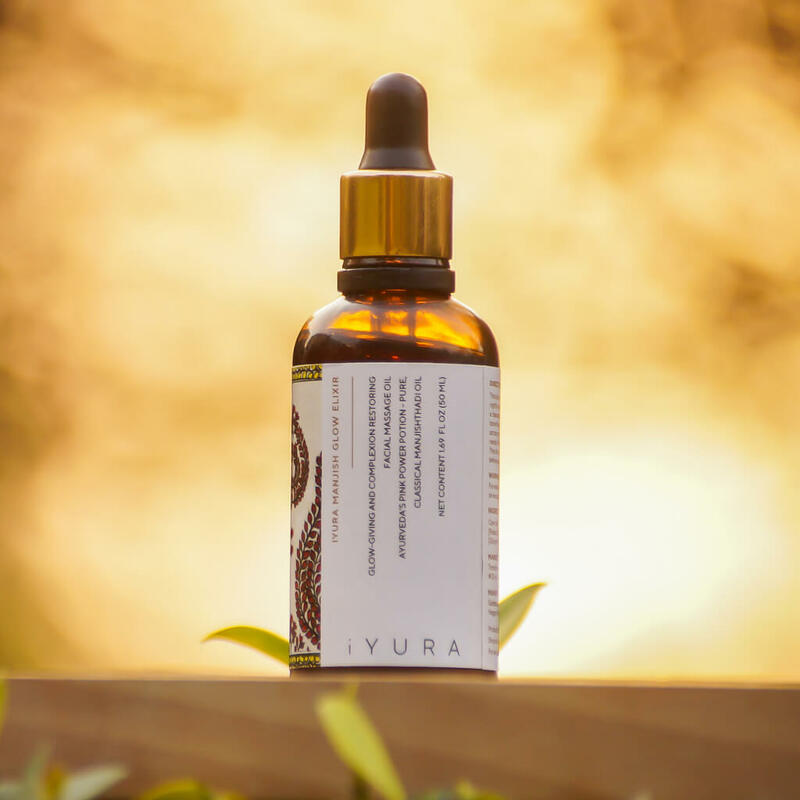 If you break out by just the thought of oil on your face, but your heart breaks that you can’t use one, this elixir is for you! This oil is not your usual face oil. In some countries, formulations like Manjishthadi Oil are treated at par with medicinal products! 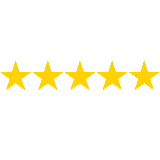 Well, to start, numerous scientific studies and tests prove how this classical formulation works to create visible change in the skin. But to learn how it does what it does, let’s delve deeper into its color. The name of this herb, which is known to be a trustable ally of women, is literally translated into “bright red” and refers to its red roots, which according to Ayurveda, lend it lymph-moving and cleansing properties. While other plants that have red roots (like beet root) are also highly acclaimed as lymph movers, Manjistha is considered to be the most potent of the bunch. Reputed as a great blood cleanser and lymph mover, Manjishtha is fantastic for the skin! According to Ayurveda, if the body does not detoxify properly, the lymph and the blood tissues are the first tissues to become congested. We know when we have acne, dermatitis or skin conditions that it’s time to detox! This is one of the biggest reasons why this herb is considered to be one of the best for the skin. 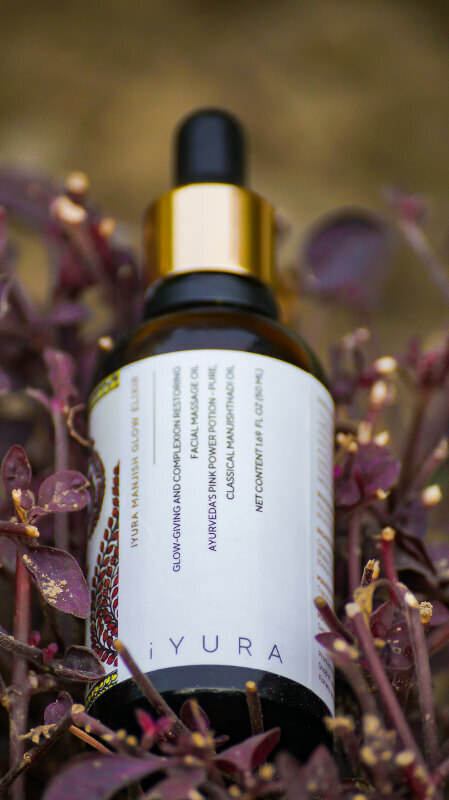 A celebrated rejuvenative and complexion enhancer, it helps the skin in balancing breakouts, itchiness and uneven skin tone as it's a potent detoxifier! 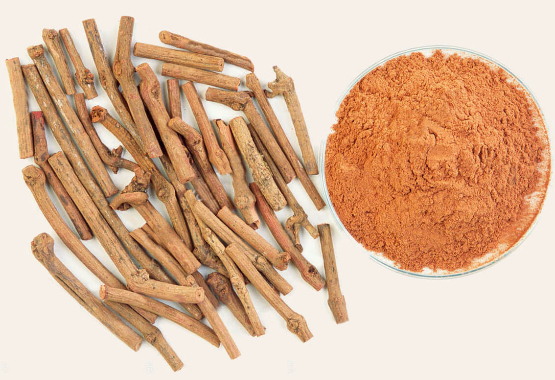 Modern research verifies Manjishtha’s reputation of a very good skin care herb also used to make the complexion even and tone down unevenly pigmented spots. and blood purifying (rakta śodhaka). Chemically, it contains glucosides known as Manjisthin and Purpurine, along with resins and lime salts. To quote a research paper, “Methanol extract of of Manjishtha or Rubia cordifolia inhibits proliferation of P. acne. It is moderately effective against TNF-alpha (Tumor Necrosis Factor-alpha) and shows low activity against IL-8 (Inter Leukin-8). It is regarded as astringent and useful in external inflammations like ulcers and skin diseases." TNF-alpha and IL-8 have a role in the development of acne and are found in increased concentrations in acne lesions. Roots of R. cordifolia (Rubiaceae) are rich in anthraquinones characterized for their anti-inflammatory as well as wound healing property. In a test, a gel formulation containing 0.1 % of anthraquinone rich fraction exhibited optimum anti-acne activity against P.acne, S.epidermidis, M.furfur, when compared with standard i.e. Clindamycin gel. The anti-inflammatory action of Manjishtha or Rubia Cordifolia is because of the presence of rubimallin. Extract of R. cordifolia showed a significant inhibitory activity against P. acnes standardized culture. 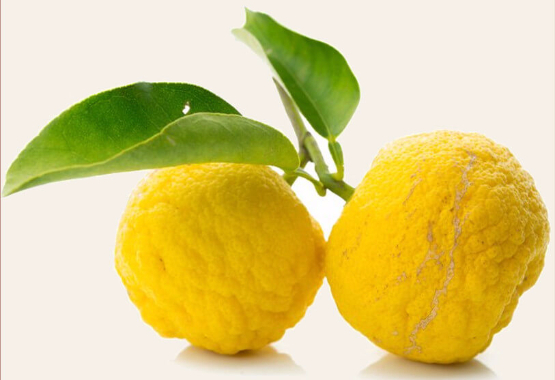 Wild lemons look similar to lemons but have a more oblong shape, thicker skin and less pulp. Ayurveda uses this medicinal plant in many formulations that are aimed at balancing Pitta and to promote heart health. 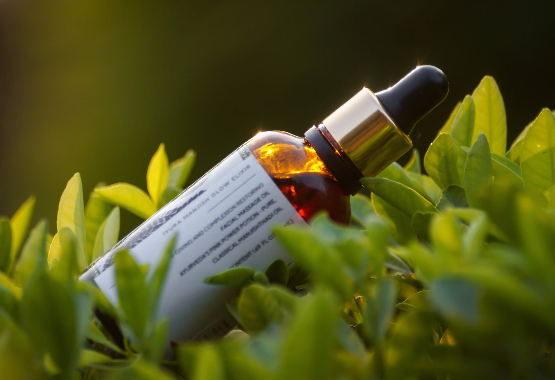 As a part of a skin-care oil, the fact that it is very rich in vitamin C which plays a key role in the formation of collagen as well as improve elasticity and reduce the appearance of wrinkles, makes it a desirable ingredient! These fruits are rich in calcium, phosphorus, iron and carotene and help maintain the luster of the skin. Citrus flavonoids like hesperidin, diosmin, quercetin and other flavonoids have shown dose dependent anti-inflammatory activity by influencing metabolism of arachidonic acid and histamine release. It has antifungal and antiviral activity due to the flavonoids present in it. It is used as a part of several anti-acne formulations. The flavonoid present in it has ability to inhibit lipid peroxidation, it possesses potent antioxidant activity. Vitamin C present in it decreases melanin production by inhibiting tyrosinase and lightening skin hyperpigmentation. It improves the skin’s collagen and fiber production. It also is a protective anti-oxidant. Its seeds are used to obtain a yellow, butter like liquid used as fat. This butter melts immediately upon contact with the skin. It is believed that Mahua Butter keeps drying of the skin at bay and may slow down the appearance of wrinkles and degeneration of skin cells and restores skin flexibility. BUT - note and notice this - this recipe was written thousands of years ago in an Ayurvedic text called ‘Chakradutt’. Interestingly, the part of this tree used in this recipe is neither the flowers nor the leaves, but the bark! This recipe contains Butter Tree Bark, which, as modern research shows, contains 2 active ingredients that help in collagen synthesis and protection. This property is useful for rejuvenation and youthful appearance of the skin. Isn’t it wonderful how thousands of years ago, when there were no ‘lab tests’, this choice of using the bark rather than the other parts of the tree was made keeping in mind its unique properties?! 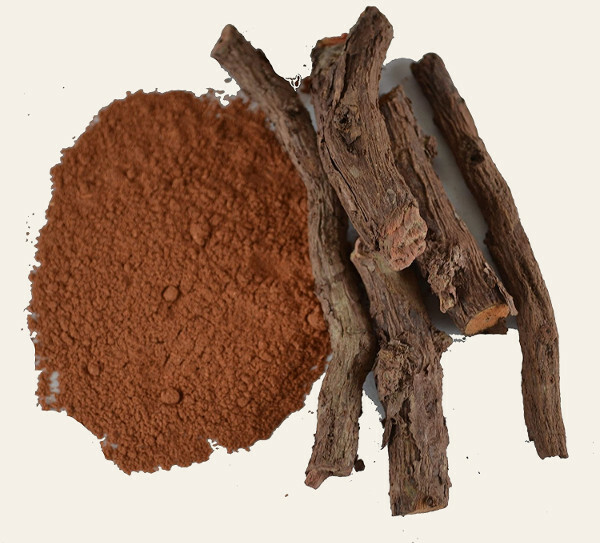 Modern scientific tests and researches have shown that Methanol extract of flowers, leaves, stem, and stem bark of M. longifolia had been reported to have antimicrobial activity. 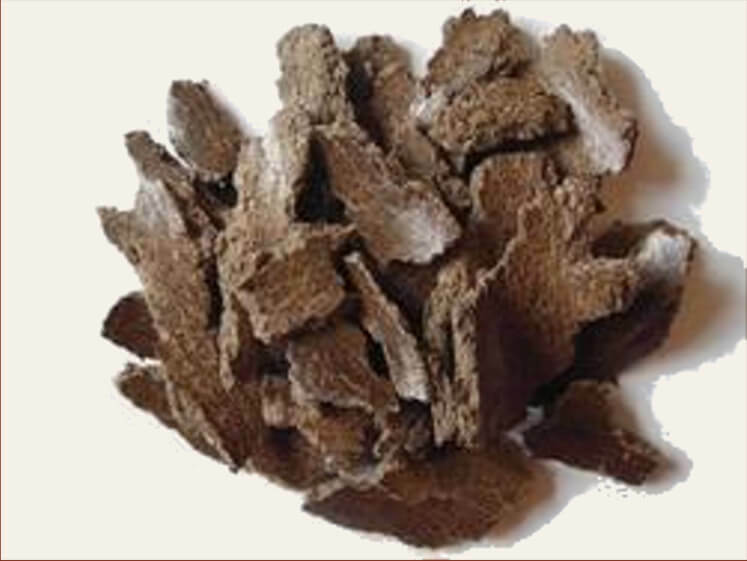 The extract from the stem bark of M. longifolia were observed to have better activity than the leaves. Antioxidant activity of the crude extracts was assessed by means of DPPH free radical scavenging method where ascorbic acid was used as standard with IC50 value 45.738µg/ml. Leaves and barks of M. longifolia showed considerable antioxidant activity with IC50 values 61.832 µg/ml & 66.342 µg/ml respectively. In another test, Ursolic acid found in butter tree stem extracts showed anti-aging effects on the skin of the participants. Always perform a patch test to test for allergies. For external use only. Contains cow milk. Not tested on animals. Cleanse your face as usual. 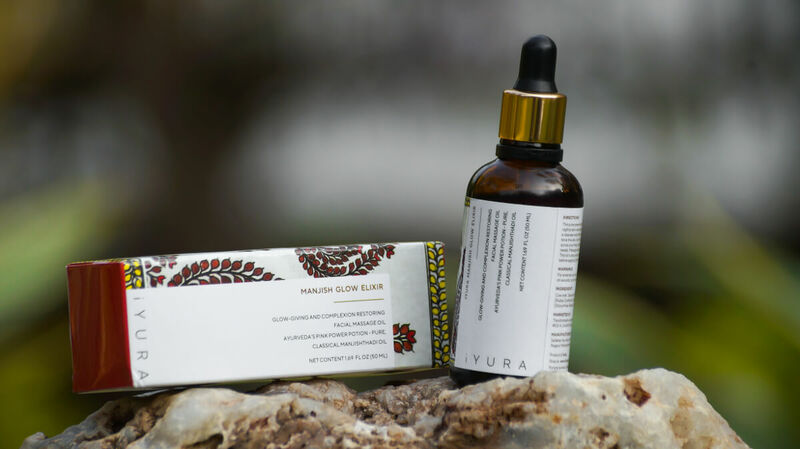 You can use the iYURA Ubtan, which is both a cleanser and exfoliator. Do continuously for 7 nights and notice a difference! It is not just another face oil that smells like flowers and makes your face feel nice and soft. Considered to be almost a medicinal Ayurvedic oil in certain countries, this formulation has been designed with a specific purpose. 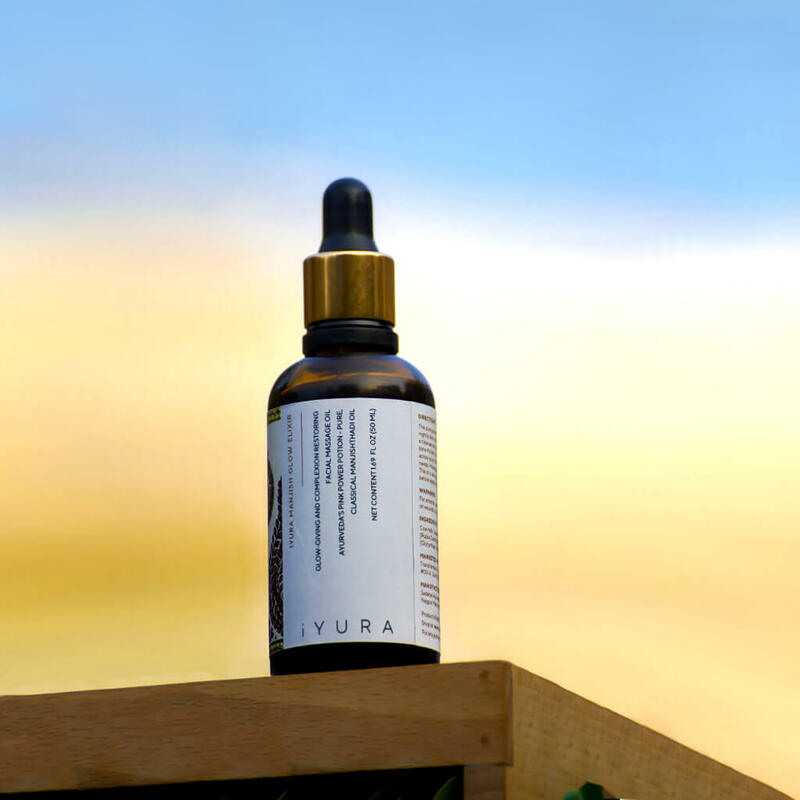 If acne, dullness, age spots, blemishes or patches of uneven skin-tone bother you, you will love to try this oil! Manjish Glow Elixir™ is a unique oil which uses the strength of 5 powerful herbs which are not easily available here in the West, that work in different ways to bring out a clear, even complexion. 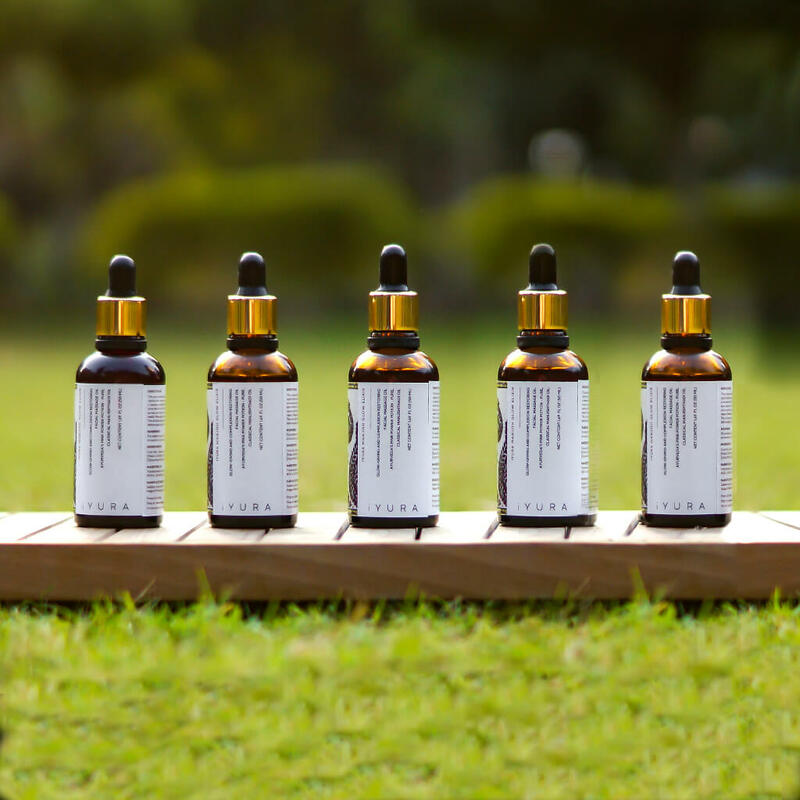 A pure, classical Ayurvedic formulation untouched by anything beyond the books - there’s nothing hidden from you. A lot of companies alter formulations by adding ingredients without communicating the same or do not use herbs in the recommended concentration. With iYURA Classical products, you’re assured this will not happen. This oil is very light, non-sticky and free of any added fragrance. It’s the kind of oil which will disappear into your skin but will still give you a sort of softness that a cream can never give! In fact, Manjish Glow Elixir™ pairs wonderfully with iYURA Kesaradi Oil from the iYURA Essentials range to complete your day and night skin-care regime. If you specifically want to smoothen the appearance of uneven skin, specially if you're someone prone to blemishes, acne, dullness, uneven and aged skin, this oil will work in a targeted manner at night. During the day, get added nutritive benefits from our day oils but at night, let Manjish Glow Elixir™ work its magic and see in just 7 days! BUY 4 & GET 1 FREE! 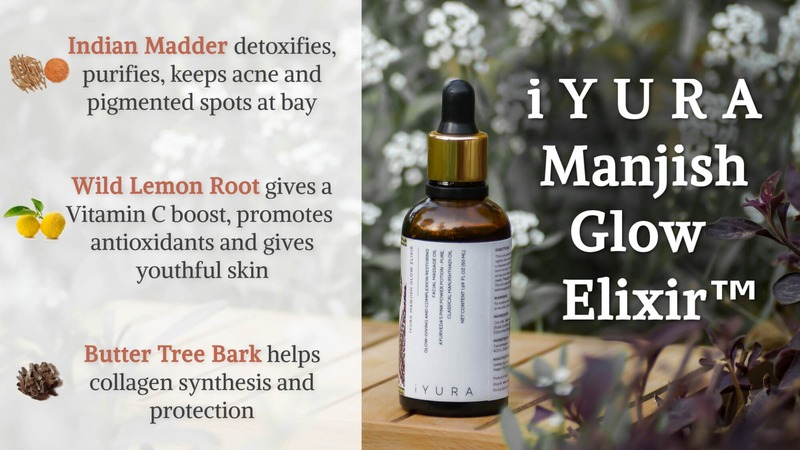 iYURA’s Manjish Glow Elixir™ is a part of iYURA’s Classical Collection of products. ‘Madhubani’ painting is a style of painting unique to the Mithila region in Northern India. 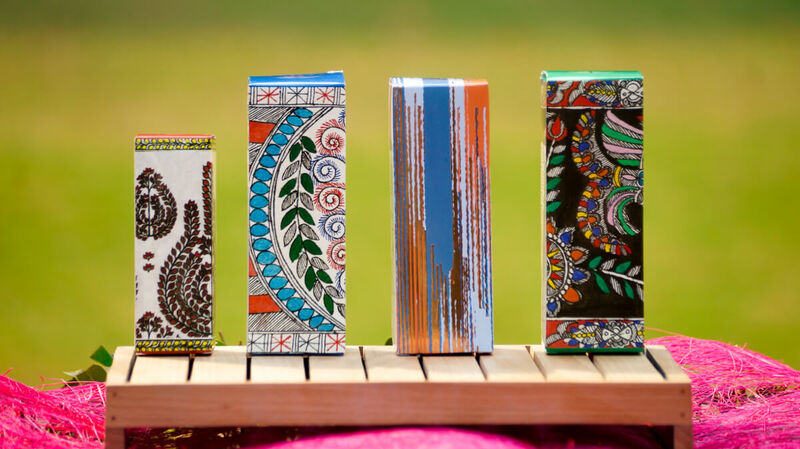 This kind of artwork, hand-painted by artisans, not only makes iYURA Classical products uniquely identifiable at just one look, but they also place the products in the ancient, rich, cultural context they belong to. 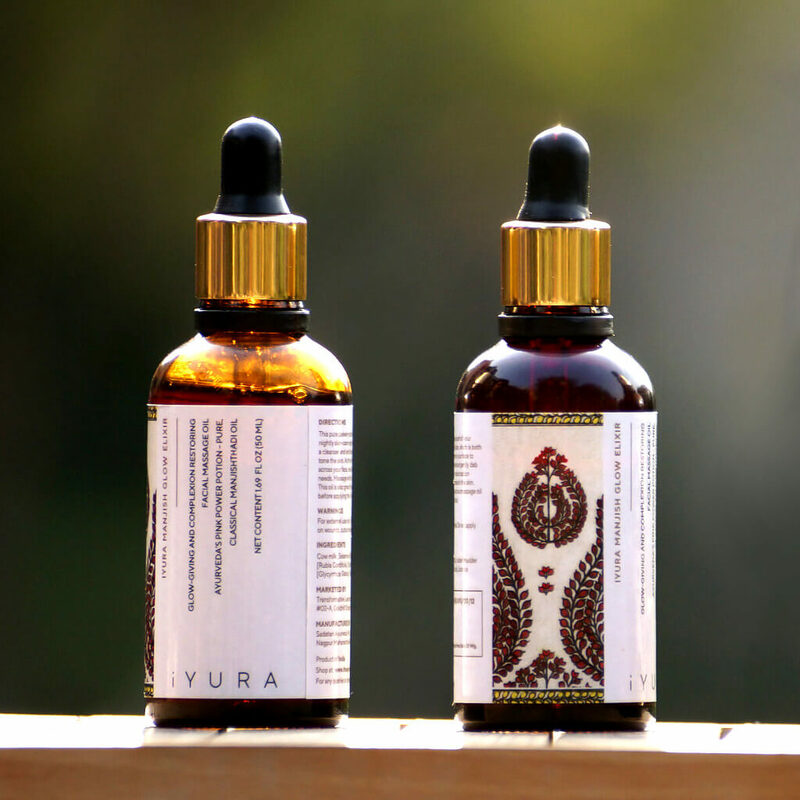 iYURA’s Classical collection of products comprises of products taken straight from ancient Ayurvedic texts like Charaka Samhita, Sushruta Samhita, Vagbhata Samhitas, Yog Ratnakar, Bhaishajya Ratnavali, Chakradutt amongst others. 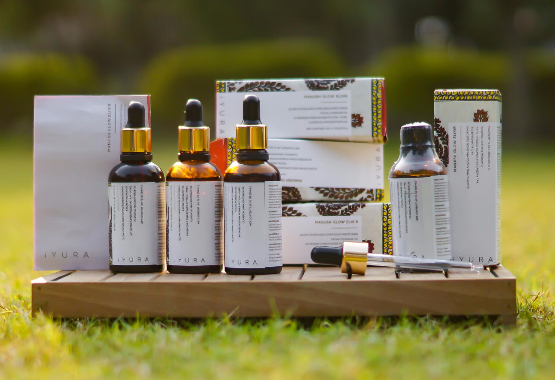 Strictly following the ancient Ayurvedic texts, products in the Classical Collection are absolutely unaltered formulations. Each of these products has a very specific purpose and a higher concentration or number of unique and potent herbs. Now, problems like acne, blemishes and uneven skin tone don't get resolved in a single one hour session. You need at least 4 sessions, which means anything between $400 - $2000! You're getting this premium elixir for just $45 and it will probably last you anything from 3 months to a year, depending on how much you use! Just 4 drops every day are enough, but use as much as you like, cause you're saving hundreds of dollars by investing in just 1 bottle!